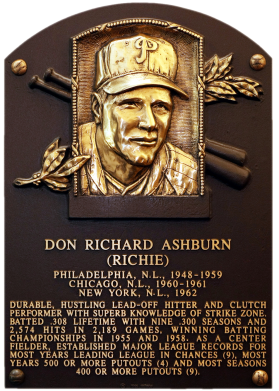 Comments: A 1961 Topps PSA 8 was my first Richie Ashburn but later sold in October, 1999. In September, 2000 I purchased a 1954 Topps PSA 8 and stuck with it until September, 2007. At that time, I wanted to diversify the collection a little with new type cards and already had 1954 Topps represented by an Ernie Banks rookie. 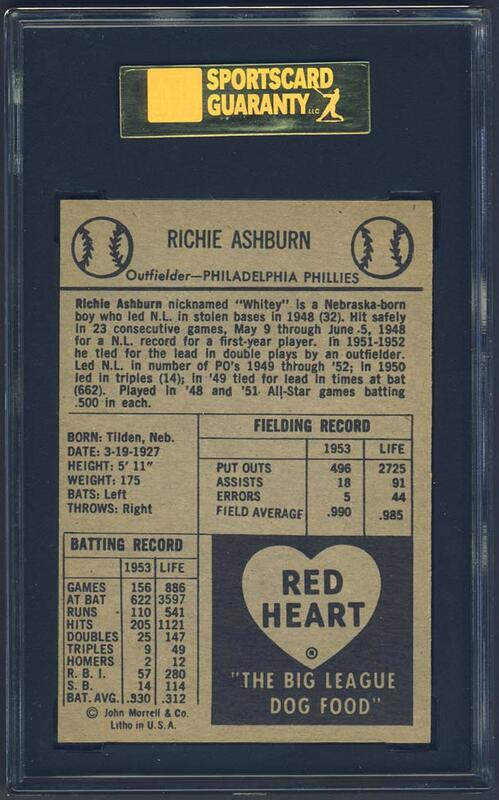 So, I though the 1954 Red Hearts was a great option and purchased a PSA 7 example on eBay. In June, 2010 I upgraded the card to a SGC 88 - for a mere $75 more than I what I paid for the NM card from a friend in the hobby, Jeff Britton. The card has that "fresh from the pack" appeal with glossy surfaces, vibrant colors and razor corners. It's just a little off center left to right. 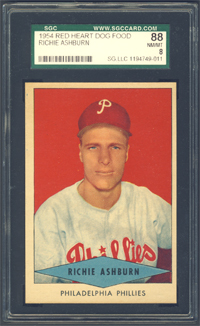 Description: This set of 33 cards was issued in three color-coded series by the Red Heart Dog Food Co. Card fronts feature hand-colored photos on either a blue, green or red background. The 11 red-background cards are scarcer than the 11-card blue or green series. 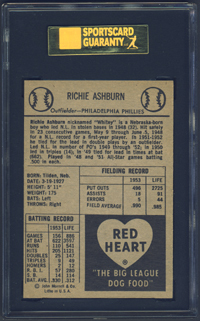 Backs of the 2-5/8" X 3-3/4" cards contain biographical and statistical information along with a Red Heart ad. Each 11-card series was available via a mail-in offer. As late as the early 1970s, the company was still sending cards to collectors who requested them.